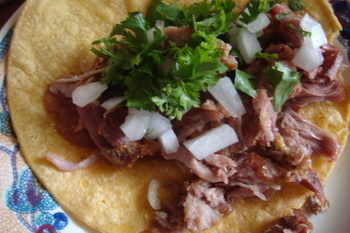 Carnitas-another less expensive meal - mmm-yoso!!! Blogging...about food...still. That's mmm-yoso!!! Today, Cathy is back with another easy meal. Hi. I am sort of doing a series of "$5 Fridays" recipes, (OK, well, two in a row anyhow). Meals that can be made, maybe with stuff that is on sale locally in San Diego, for about $5 for two people. But also at regular prices the food is not terribly expensive. Simple recipes. 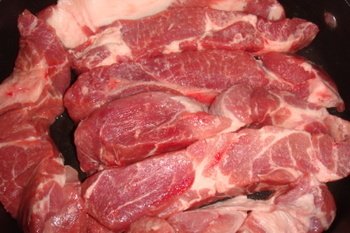 Carnitas. I *love* carnitas. Essentially, fried pork. Seems so difficult, eh? Nope. A lovely Polish lady by the name of Martha Stewart had this 'recipe' which I have adapted. Country Style pork shoulder . 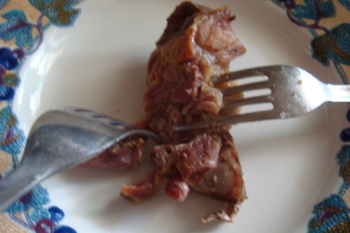 Sometimes called Country Style ribs. You've seen them in the grocery store. They were 99¢ a pound two weeks ago, are on sale for $2.29 a pound this week at Vons and apparently some people buy them for $4.46 a pound. As if. 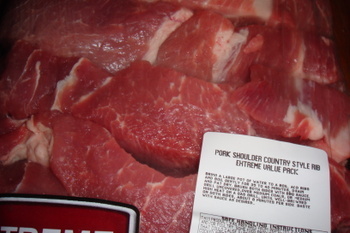 I happen to know that it takes four pounds of this meat to fill my one deep fry pan. (Circulon commercial 12 inch 5.7 L). Buying 4 lbs makes the $5 part kind of not there, unless you figure how many meals you get out of four pounds...There was exactly one bone in all of this package I bought. 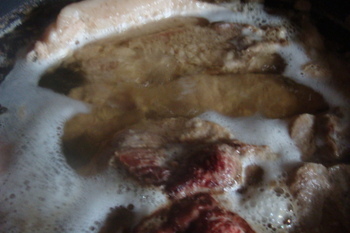 Cover all that meat with water. NOTHING. No spices, no herbs. N-o-t-h-i-n-g. It will boil. The water will get low. You'll hear a sizzle when the water is almost gone. Let it sizzle a bit, so some of the meat sticks to the pan. The bone(s) will fall out, no problem. 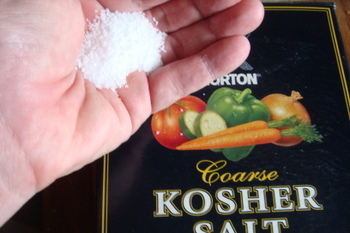 There will be a crispy, salty (but not overly salty) bottom to the pieces. The meat will shred easily. I promise. 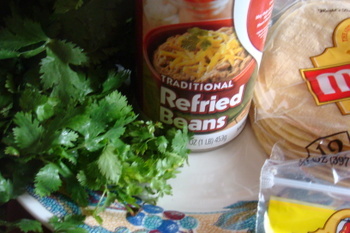 Serve with tortillas (on sale for $1.25 at Vons), refried beans (75¢ for the generic can or 10 for $10 if you are mathematically challenged), cilantro (25¢ at Henry's) and chopped onion. I don't like cheese or guacamole with it. (although avocados are 77¢ at Henry's). The pure, simple flavors are what matters. The extra meat tastes wonderful on a salad or reheated for more tacos. Boil on low until water is gone. About an hour. Let crisp for about an extra minute or two once you hear the sizzle start. Now that is easy! Pork boiled alone is so flavorful but this little twist is even better. A bit of orange juice is a nice additive. So simple, so delicious! 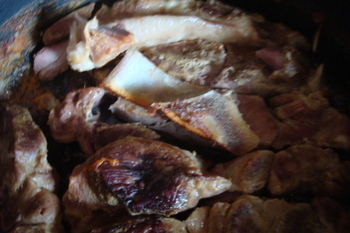 I love carnitas and I love that it's a frugal meal. I can't ever get the yellow corn tortillas here though and I'm coveting yours. Great simple recipe. Carnitas is so porky good. I'll have to try making it this way. Yum. My only suggestion would be to get better corn tortillas. Living out here on the border, I've become a corn tortilla snob. No guar gum or other additives and preservatives. I've seen the ungringoed style at North Park Produce and I'm sure they are available elsewhere. Try 'em, and I'm sure you will notice the difference. Thanks for the recipe Cathy! I always wondered what to do with those bargain cuts I see often at Henry's..
One question, do you skim off the foam while cooking or just leave? We've done it with OJ, TLB, and spices and herbs and tried it so many ways. This way works out also. Sometimes I crave the pure pork fat goodness and flavor. Thanks, ed. I went to NPP in EL Cajon (it is new and clean still) and the tortilla/bread section kind of sucked. I do get fresh made ones at El Porvenir when I am near the Coronado Bridge and crave the difference. I find that if I put these store ones in a hot skillet with real butter, they end up having a good flavor, albeit thin texture. Hey, Dennis-just leave the foam that forms when boiling. Do nothing. So simple-and tasty. Yes, Henry's will have shoulder on sale for 99¢ a pound every few weeks. I love the unadvertised manager specials each store has also. I think Cathy needs to start her own taco truck! I hope you try making cabeza or suadero ...it's cheek and brisket! Also my favourites. Remember - Its a Pork Fat Thing. I like it Michahuacan style, fried in a bit of rich lard and some pepper to go with the salt after its been simmered. That way I can get it 'frizzled' around the edges. Que buenisimo, Cathy. I am impressed!! I agree. Time to start your own Taco Truck. Good Carnitas are not easy to come by! Hey Charlie-I sort of think this was how I'd eat all the time too if I were a student(and young) again. Which is to say, you don't need the lard, Bri, really...when the water goes, the sizzle starts and the crispiness happens. I have made the pork with lard and spices and all sorts of complicated ways. This tastes great (I think better) and is easy to clean up. Welcome, Bloggin Town! Hope I may have made your life easy. You've been busy. cool!! looks so easy, I think we'll try this some time. It is easy, TMAH! Most of the time, pure and simple is best-and the most difficult to achieve. Awesome. My little brother is coming from out of town this evening. He will be greeted with cathynitas. I'm stoked because all the methods I've ever tried involved a lot of stuff going on (herbs, spices, sugar, even Coke), but I think this will turn out better. I've always been a little disappointed with my efforts. I don't think I can screw this one up! ;) Thanks!